The perfect excuse for a night out has arrived! If you love fashion and showing support for animals- this is one event not to be missed! Fashion for a Cause is a charity fashion show aimed at raising much needed funds and awareness for local 4 Paws Animal Rescue based in Sippy Downs. 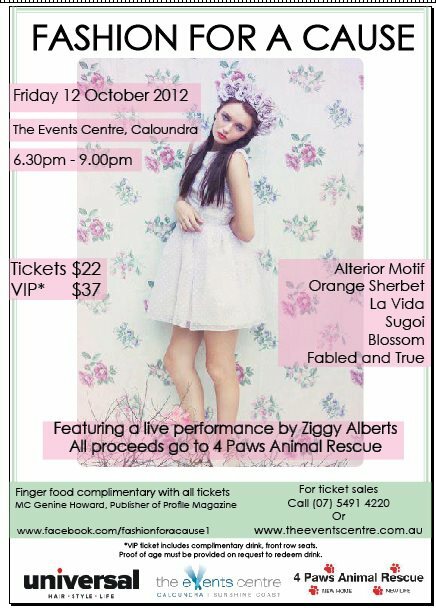 The night will be held at the Event Centre, Caloundra on Friday 12th of October 2012, from 6.30 – 9.00pm. Fashion for a Cause will showcasing designs from local boutiques including Alterior Motif, Fabled and True, Blossom, La Vida, Orange Sherbet and Sugoi. The night will also include a live performance by the very talented Ziggy Alberts, a raffle as well as stalls from which people can buy clothing seen on the runway. Food and drink will also be available for guests. 4 Paws Animal Rescue Shelter is a non-profit-organisation that provides refuge for homeless dogs and cats on the Sunshine Coast. 4 Paws runs successfully due to the dedicated team of volunteers, sponsors, supporters and members, and without all this support 4 Paws could not help find the animals of the Sunshine Coast that ‘forever home’. • VIP: $37 *Front row seats, glass of wine on arrival, VIP treatment. Proof of age must be presented upon request. Visit the official Fashion for a Cause Facebook Page for more details.